Modeled after the successful Night Before Christmas Gift Set that sold out within weeks of its first printing comes the Night Before Christmas Keepsake Gift Set. This cherished set includes a miniature version of the #1 New York Times bestseller edition and a beautifully hand-painted ornament that will be treasured for generations to come. The magical sights and sounds of Christmas are brought to life with this Night Before Christmas Keepsake Gift Set. 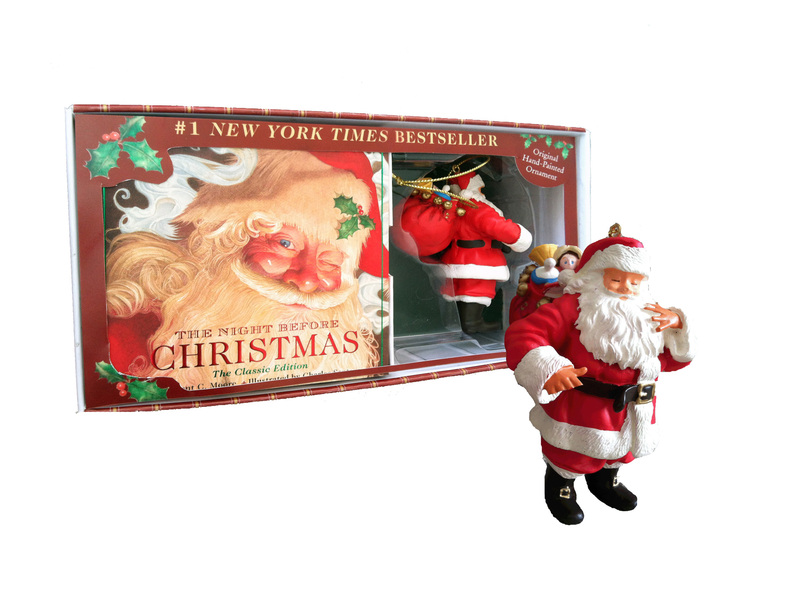 The #1 New York Times bestselling classic edition is faithfully reproduced in a miniature version, and includes a beautifully hand-painted ornament. The full-color original illustrations by award-winning illustrator Charles Santore dance across the magnificent spreads of this holiday treasure that contains a 4-panel gatefold. A hanging loop is attached to the ribbon marker in the book, so it can be used as an ornament itself. Together, the book and ornament make a wonderful gift for anyone on your Christmas list, as well as the perfect addition to your own home collection! Families will treasure this set as a true keepsake and heirloom for many generations.